Warm Bodies – the movie! Do you guys remember me going all crazy about a zombie short story a friend had sent me and then going equally crazy about the book it turned into? I am actually very pleased with it; the characters all look pretty close to how I imagined them in my head, with the bonus of John Malkovich, of whom I’m a long-standing fan. I heard this theory that vampires are popular when the Democrats are in power because the fear is that Democrats are moral degenerates, and zombies are popular when Republicans are in power because the fear is that Republicans are mindless hordes. It’s entertaining, but doesn’t really seem to hold true. The current vampire fad (these things do seem to see-saw) seemed to have started back with Bush in office, and right now I think we are seeing a decline in vampires and an upswing in zombies while Obama is in office. Anyway, all of this is to say that I think Warm Bodies is very much talking about our current culture (at least in the U.S.), where people feel isolated and disenfranchised (i.e. dead). The zombie protagonist fights against his very nature to attempt to have memories and feelings, and it is poetic, sweet and depressing, all at once. I like to imagine that the Isaac Marion was out with friends and they were talking about the current romanticism of creatures like werewolves and vampires that used to be fearsome and grotesque. And maybe a friend dared him to write a book romanticizing the truly morbid, zombies, and, by God, Marion won that bet! It is, however, much more than a love story. Warm Bodies explores life, and what it means to be alive versus dead, regardless of biological conditions of life. Zombies is what lets Marion explore that. Walking dead characters want something more out of their existence, while living characters yearn for non-rising death in the post-apocolyptic land. I think the author was able to really explore an idea that I’ve been rattling around in my brain for a while (but have been unable to really pin down), which is that our culture seems increasingly fascinated with the idea of an Apocalypse. Now, I have a tendency to assume my thoughts and feelings reflect the thoughts and feelings of our society as a whole, so definitely take that into consideration. It feels like in 1999, when Y2K was imminent, everyone was all abuzz with it, but with real concern and fear for the changes it could inflict. The current 2012 talk feels a bit more wistful than nervous, like we know not to expect anything, but that we are actually hoping that something will happen. That there is a pervasive and growing idea that there is something wrong with our society, that we are on the wrong track, but that it will take a big upheaval to make a change and we need something badly to trigger this change. That is what Warm Bodies is all about to me. I will say that the ending doesn’t quite stand up to the rest of the book, though it is still very good. Like a lot of authors who are trying to relate pretty complicated themes in a narrative structure, Marion somewhat wrote himself into a bit of a corner. Even so, I’m still going to go ahead and say it: come-what-may in December, I’m declaring this as my favorite book of 2011. Oh, one last thing: the book begins with a scenario very similar to the short story that I previously posted about, but veers off into a new direction that was initially disconcerting to me, but of course paid off in the end. It does, however, undo some of the more simple sweetness of the original short story, which made me a little sad. 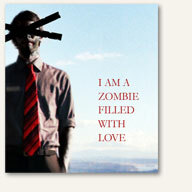 I Am a Zombie Filled With Love is the sweetest, zombie-perspective love story you will ever read! It isn’t very long, so jump over there and read it right now! I was thrilled to read at the very end that it has become a full-length book called Warm Bodies that will be available in the U.S. in March. It is definitely going on my to-read list. I can’t wait! Amended: It is out right now! It is being shelved at my library at this very moment, according to their website! I’ll have to run over there as early in the morning as I can drag myself out of bed (which probably means right at the crack of noon). I’m usually pretty frugal in my use of exclamation marks, but I’m just so excited!